The Waiting Room offers fried chicken, oysters and champagne. Southern cuisine is not the nucleus of the concept; we offer Louisiana style fried chicken and other southern cooking techniques, but we are driven with local Northwest ingredients and inspirations. 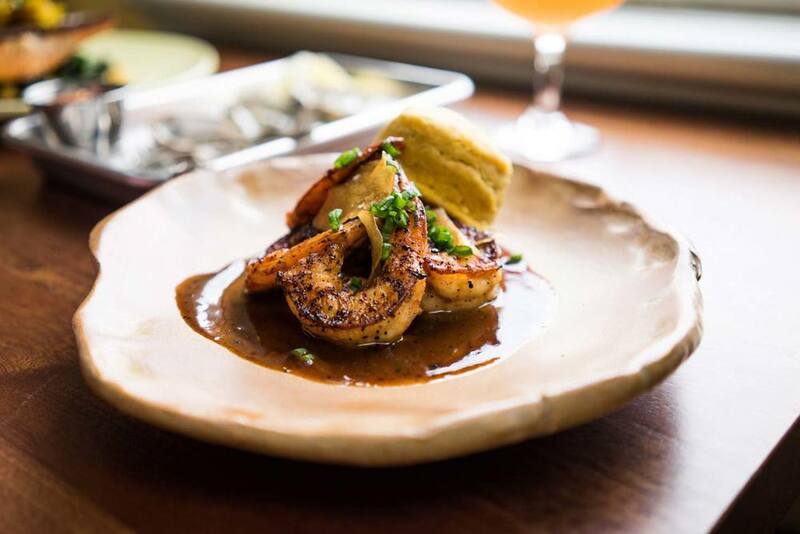 We are interested in southern comfort, southern charm, and southern hospitality, along with sourcing from local farmers and ranchers, from Your Kitchen Garden, Sauvie Island Organics, and Cattail Creek Farm, to Katz Olive Oil and Vinegar and Nevor Shellfish in Netarts Bay. Call (503) 477–4380 from 11a – 10p daily, or book online with Resy. Everything – weddings, corporate lunches, birthday parties, baby showers, holiday parties, happy hour events, and more. We require 4 business days notice on all pick up/delivery orders. For example, if order is placed on January 23rd, the first available option to pick up or have food delivered is Jan 27th. – We request a 50% deposit to confirm an order. The remainder will be charged upon delivery. Order confirmation and credit card receipt will be sent within 24 hours (one business day). Orders will receive confirmation phone call 24 hours before the event. Food will arrive ready to eat. Delivery is drop off only, this does not include set up or clean up. Sorry we cannot allow substitutions for package deals. “The Waiting Room” stems from a song by the DC band Fugazi, and implements inspiration from the DIY subculture of skateboarding and playing music in the 80’s and 90’s. If you look around the restaurant, everything you see was a DIY project. Although it may seem more arts and craft than punk rock and frontside grinds, the spirit of Fugazi and skateboarding fueled our intentions. With a small team of loyal friends, we were able to do everything ourselves, as well as support local artists in the doing. Our tables were made by local woodworker Josh Pew, the bar shelving was crafted by local artist Jose Oyague, our plates were hand made by local Lonesomeville Pottery, and the bar top and pass were built by us, along with the lighting and numerous other accents in this space. But we aren’t done yet. We have plans for the near future. Visit us again soon and you will enjoy an upstairs crudo and oyster bar, downstairs and upstairs balcony seating, a private dining room, new linens, and many other details that we weren’t quite able to bring to fruition just yet. It’s been a long road for chefs Kyle and Tom to get here, but at no point will they be at the end of it. We look forward to turning this old house into something beautiful again.